I Brake For Yellow Dresses! 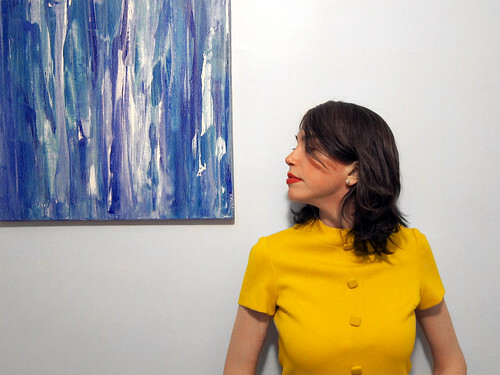 Every year around spring/summertime, I find myself drawn to ridonculously bright, cheery yellow dresses. I'm not even sure it's my color, since I have such pale skin, but I'm also a brunette, so maybe it's okay after all? One of my style icons is Shelley Duvall's character Millie in Three Women, always looking fresh and pretty in her yellow frocks. I should really buy that movie so I can grab some screencaps to share with you; I can't really find any online and it's such a pretty film. Why aren't there more people blogging Millie's style? Oh, gloves. Please won't you come back into fashion? I have a small collection of my grandmother's old gloves; I'm sure you'll be seeing them here from time to time as I do wear them!